Our apologies for our tardiness in keeping in touch. Following a whirlwind of meetings in Vancouver re LABYRINTH SUBLIME, welcoming dear friends visiting from Australia, enjoying our son’s high school graduation, hosting six graduates at our home for a few days, simply go-go-go these past two weeks, we’re really pleased to pause a moment and catch our breaths to share with you the latest news on the creation of LABYRINTH SUBLIME. Last we wrote, LABYRINTH SUBLIME was being well packaged by Friesens for shipment to Georgetown, Ontario, a city west of Toronto where our bindery and warehouse are located. Courtesy of Friesen, below is a photo of our project loaded into transport truck trailer just prior to the start of this 2000-mile journey. Our eight skids (four per side, book-ended front and back by another customer’s pallets) are those protected all around with white corner bumpers. Each of our skids is labelled in large black letters DO NOT STACK, meaning that a second tier of pallets are not to be placed on top of our cartons due to weight and compression concerns; which of course, means that our shipping costs are appreciably higher (i.e. double). 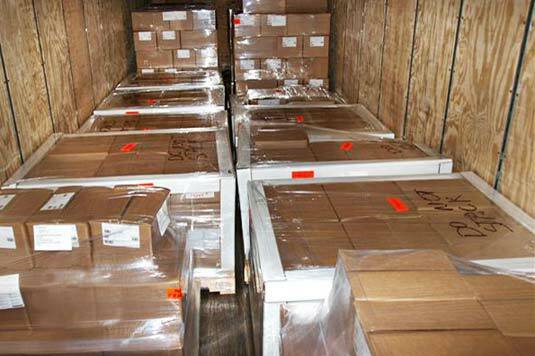 On Friday, June 10th, the shipment was received at Georgetown Terminal Warehouse (GTW). Today we’d like to introduce a few of the fine people at GTW who have been keen supporters of our work for a decade. 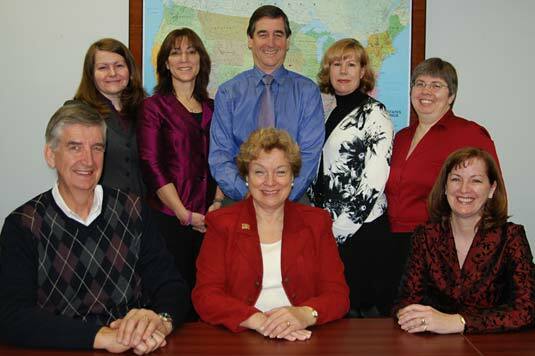 In the photo that follows: Front and centre is Brenda Sisnett, President & CEO, with her husband Larry Sisnett, Vice-President, Business Strategy, standing directly behind. Seated on either side of Brenda are Hank Visser, Director, New Business Development, and Christine Costello, Chief Operating Officer. Lesley Reynolds, Lizanne Gray, and Debbie Beedham, administration, are standing. (Photo courtesy GTW). Brenda, Larry, Hank, and all the people at GTW have been ever so kind to us over these past many years, caring for ANTARCTICA and now LABYRINTH SUBLIME. GTW has been storing our book blocks (collated and approved sets of pages) and expediting the delivery of these book blocks to nearby Felton Bookbinding as the bindery required — the bindery being short of space themselves. GTW is also storing our finished hand-bound tomes while we find homes for all. They are doing much in sponsorship for our work for which we are so very grateful. The Sisnetts and Hank believe in the quality we strive to attain, and they appreciate that such determination is quite rare today. Being entrepreneurs themselves immersed in the book world, they are well aware of our challenges and needs. From the heart, we thank Brenda, Larry and Hank for their personal interest in our tomes and for the warm friendship that has developed over these many years. LABYRINTH SUBLIME having arrived at GTW, and as we are not their ourselves, we asked that photos be taken for us. Smiles are broad as LABYRINTH SUBLIME (one skid of which is on the power jack, foreground) is being moved into the warehouse. 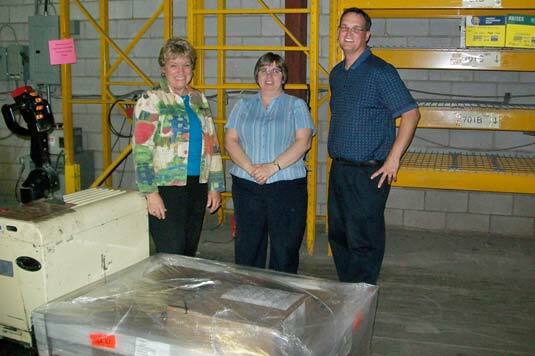 From left to right are: Brenda Sisnett, President & CEO, Debbie Beedham, Account Manager, and Matt Harris, Director of Warehouse Operations. Over the months to come Matt and Debbie will be instrumental to moving our pallets as needed to and from Felton Bookbinding. That our tomes in their various stages of completion are stored at Georgetown Terminal Warehouse gives us immeasurable comfort. 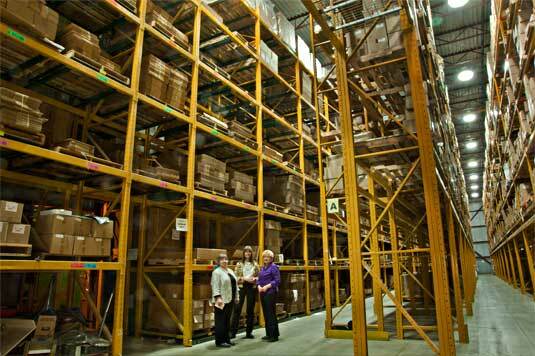 GTW is among Canada’s largest book distribution specialists. GTW provides publishers with logistics services that extend beyond climate-controlled, secure storage. Their ultra-modern 80,000 square foot warehouse is a facility designed to efficiently handle all aspects of book distribution including freight forwarding, returns processing, fulfillment and other custom services. Our next updates will shift over to activities at Felton Bookbinding where the final binding tests are being completed, and also from Friesens’ specialty packaging department were the linen presentation boxes will be made once just as soon as the final prototype is approved. These approvals should be made by the end of next week. Then the binding of the tomes commence. From the two of us, very best wishes!! !